she united the rigour of simple geometric forms with an inner life and poetry which emanated from the richness of colour, the musicality of rhythm, the vibrant breath of the execution. She brought order and lyricism together: colour, geometry and rhythm"
The back design is a variation on the traditional harlequin pattern; there are two versions, one in red and blue and the other in green and blue. 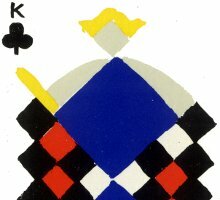 The figures of the king, queen and jack are identical in each of the four suits of the pack. 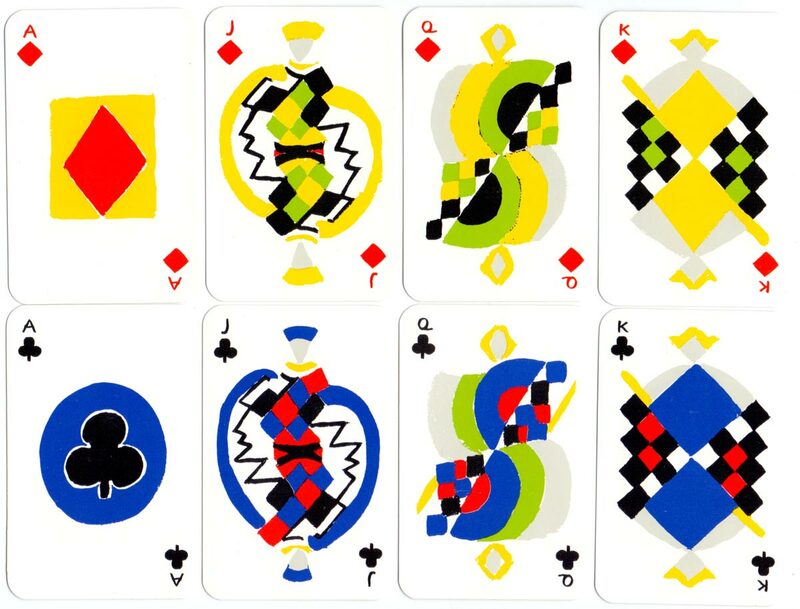 To facilitate the use of the cards, the artist developed a supplementary system of colours; the same colours are used for the twelve cards, but each suit has a different dominant colour : blue for clubs, green for spades, red for hearts and yellow for diamonds. There is nothing cold or calculating about these simultaneous cards. Sonia Delaunay disciplined her vitality to create a seemingly straight-forward composition of forms and colours; nonetheless their essential lyricism shows through. A second edition was published in 1980. Sonia Delaunay was born in Russia in 1885. Her art was one of the first expressions of abstract painting, and she influenced Paul Klee and preceded Mondrian and Matisse. 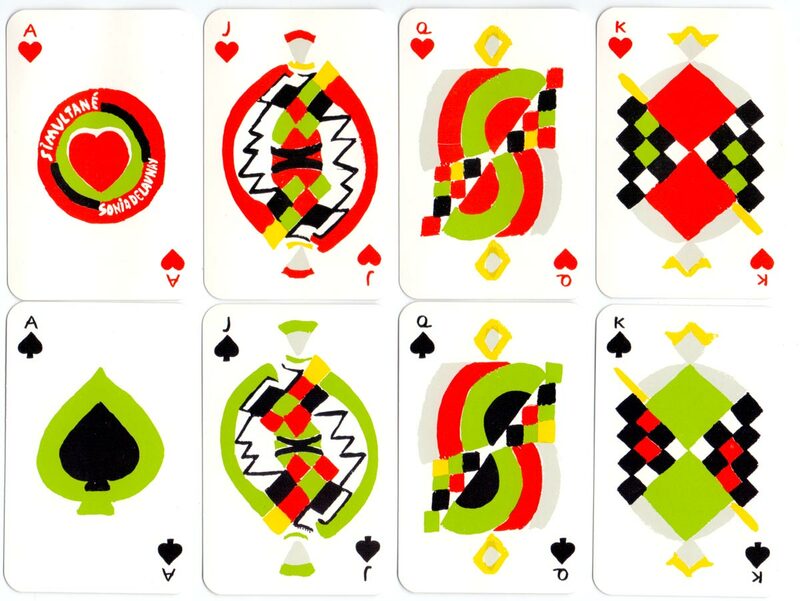 Her 'Simultané' playing cards were completed in 1964. The court cards were conceived to express the essential nature of the figure represented rather than its meaning, traditionally conveyed by ornaments, emblems and symbols. Thus the figure of the king expresses virility by means of large, static rhomboidal forms; the femininity of the queen is characterised by rounded, mobile forms; the jack is distinguished by its restlessness, playful agility and boyishness. 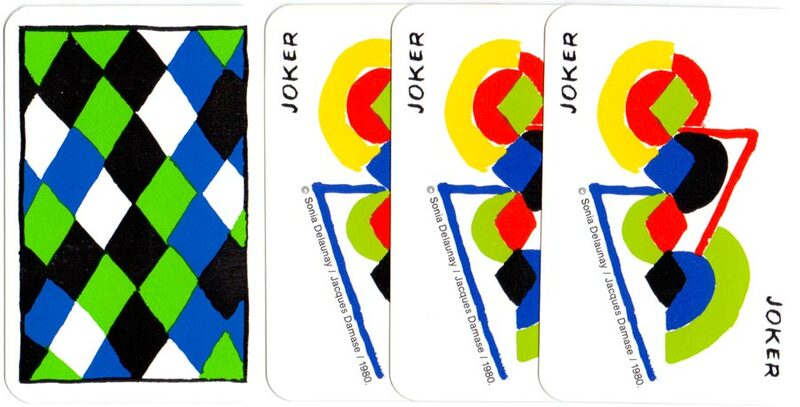 The headgear is the only traditional emblem maintained, deliberately so, for the pack of cards is an object intended for use, and not simply to satisfy the eye. 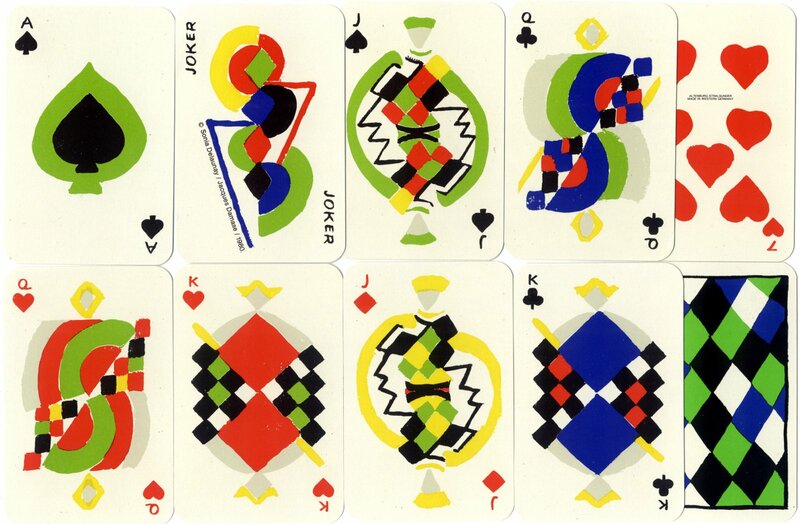 As for the two jokers, Sonia Delaunay used as a basic design, but in a more abstract fashion, her Jazz compositions from 1952.